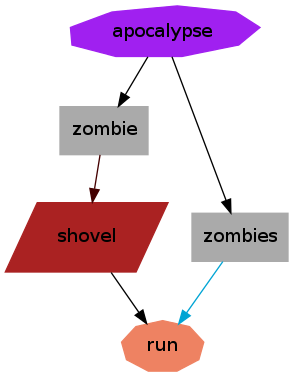 save this file as zombies.gv, then run: graphviz zombies.gv. 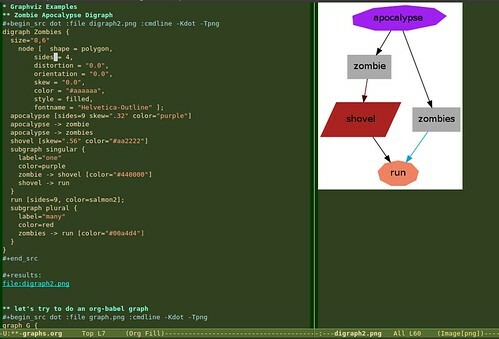 If you are interested in graphviz, you can click on any graph in this gallery and see the graphviz source for the graph. Then inside the buffer you can evaluate the code with “C-c C-c”, and you can see the results of evaluating the code with “C-c C-o”. This is made possible by Org-babel, a cool tool that allows you to run scripts from different languages in a single Org-mode buffer. Not only that but you can pipe output from one code block to another code block written in a different language. I will have more blog posts about this in the future. Org-babel is a part of Org-mode since Org-mode 7.x or so. Exciting stuff!